It was the year 1994.I was 12 years old and I was attending class 8. It was early June. Unfortunate or fortunate was I, cos I had an attack of typhoid and that meant I had to take rest at home. No school. But Oh Yea! I could watch each and every single soccer world cup match on Doordarshan. That was the only world cup which still lingers in my memory cells. Each and every player, every team, every incident, crosses my mind every now and then. I had a few dissappointments at the beginning of the tournament. The hand of God Master - maradona was banned from playing the world cup for alleged use of a banned drug,ephedrine. England did not qualify for the world cup. I was dissappointed cos I could not watch Gary Linekar in action.Tragedy loomed the first round when the Columbian defender Escobar was shot dead for scoring an own goal against USA.The death of the poor columbian footballer was the talk of the town. Here in the picture below, Escobar scores that own goal that cost his life. There were a few surprises too. Bulgaria was the giant killer of the tournament. They even shocked the 1990 Champions Germany in the quarterfinals. Bulgaria's Success was mainly due to the six toe-striker Stoichkov. 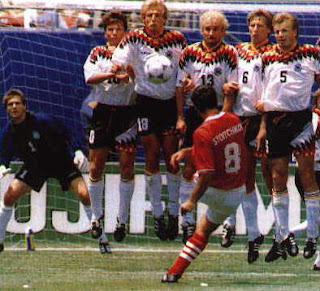 He kept on scoring goals in every match and even took their team to the semifinals where they eventually lost to the runner-up Italy who thumped them because they had the magician Roberto Baggio in their team.In the picture below Stoichkov scores the goal of the tournament in Bulgaria's shock win against Germany. The tournament also the saw the Baby-Rock celebration for the first time. In the quarter finals eventual champions were up against the colorful Holland. Brazilian,Bebeto's wife delivered a baby boy the day before and he could not be with his wife due to the match. Quite interestingly Bebeto scored in the match against the Dutch and he started this new celebration style. This celebration style is now very common even in school level soccer tournaments. But the biggest unnoticed moment in the world cup came in the second round match between Brazil and USA. Brazil eventually won 1-0 due to a wonderful goal by Bebeto. This match goes down in the history of the world cups as the most roughly played game. 7 yellow cards and 2 red cards marred this game.The Brazilians danced to the samba music and the Americans targeted the legs of the Brazilians. Just before halftime three American players cornered the Brazilian Mauro Silva and out of rage the Brazilian midfielder pushed an American defender down. The refferee rushed to the scene and in a state of confusion showed an yellow card to the US defender and flashed an yellow card to Mauro Silva also.Mauro was already shown a yellow card in the opening minutes of the game and hence the refferee flashed the dreaded Red card and gave marching orders for Mauro. Mauro showed his sense of humor at this juncture when he shouted," Why don't you just give me a Green card. I'd rather become a resident of America". This even made the refferee laugh. The world cup finally ended with Brazil lifting the cup. 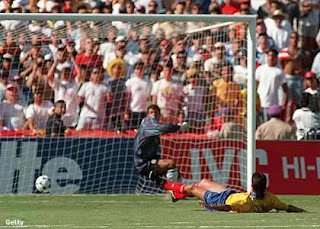 The magician roberto baggio's last magic trick became a failure as he boomed his penalty kick into the crowd. The Samba dancers danced again. Note: I played soccer too for the firm I work for. I was also the star player for my team . The interesting story about how I became a football star would soon hit this page. Welcome back!!! Missed you a lot! Oh So you are a Football star too...waiting to see how did you made it. You have an amazing memory, I can vaguely remember the incidents you speak off after reading your blog. I enjoyed reading this one , coz im a die hard football fan .Do you follow club football ? Thalaiva... U back? vaana vaana vaana (like POKKIRI) I love football.. My favorites are Germany, Engaland, Spain.... :) Holland fails at the big stage!! welcome back.. glad tthat you commented.. i lost the links in my blogroll.. now i have yours.. thanks a bbunch..
yes bro.. i stand corrected.. football it is.. with the advent of american football and the new name soccer, i was also cornered to use it.. thanks a lot..
haha.. it was a single wordcup tournament.. wanted to try a write up from memory..
i like spain and england in your list.. spain always used to fumble at the big stage too.. am glad that they did well in euro this time..
oh d escobar incident is without doubt d most shockin sportin incident ever...its right there wid d munic olympic killings!!! sad!!! i saw the movie munich... it was sad yes... and escobar incident is really so sad..
btw, love the new look of ur blog.. It is my new-found love eversince I saw Chelsea playing some 2 yrs back I guess... may be 3. I loved the post.. nothing can ever match the madnes of soccer. I was a lil small then.. So cant relate much to the memories.. I am an Arsenal fan. U ? Aah.. That goal against Liverpool..
Also for me, France = football. U ? when it comes to teams, i am on brazilian side.. Yes.. And they were tumbling in their own footsteps owing to the magician's genius.. Henry rocks..
Football! Except for the word, the spelling 'course,every little thing about football is Swahili to me considering the fact that my best friend eats,drinks,plays,romances, thinks and dreams about football and who's that handsome guy,some Kaka something. Bah, you guys are freaks I say! And for some notorious reasons, i have accustomed to believ that Football is not a girl thingy. Absolutely. Got lost somewhere in the football language!! Sorry but am expecting your another post to hit the blog!!! That how you became football player!!! Well '94 was a li'l too early for me to understand anything, but yeah I did watch the last world cup... got up at 3am to watch the semis!!! But I kinda hate club football, world cup somehow seems much better! My dearest uncle of jolena and jeremy..
WOW so you like football I am a fan of sports too..
haha.. dont ya worry.. i will shed my shirt soon and give a sallu boy look alike pose.. what say? kaka is soooper cool.. yes.. he is damn fast and deft touches.. one with a great future.. you have kenyan friends? in that case watch the american woman play football..
even am waiting for that post.. have to think cos that post will be full of lies.. this wwas easier to come up with cos this is from my memory.. but the next one would be tuff..
thats way too cool.. club fubol.. am not inclined to english nor spanish league.. the clubs shuffle with players and its pure raw business.. like real madrid, barca, man u and arsenal.. love some class players in some clubs..
even like brazilian and argentinian club futbol cos of certain players..
last worldcup was a drab affair... the final was way too cool though.. mattarazzi.. i still laugh at that.. but italians atlast proved.. yeah. where? did you see something else? carlos.. that left leg.. he has got the power of a rock there in it..
welkum back... it has been a long time since you made your visit.. I didn't miss any of the Italia 90 world cup matches thanks to Jaundice but can't recollect the incidents as you have done in your post.Can only remember Germany winning the cup and Maradona crying inconsolably at the end of the match. i remember that tournament too.. i supported brazil then.. i was 8 then.. i watched most of the matches with my uncle.. early morning..
Idhulendhu enna theridhu .. !? poi solradhu avlo easy a vardhu unaku ... !!! Hmmmm.. !! :) This person is *not* a football aficionado. Period. i love football.. but not a maniac.. you are right.. but definitely inclined to music..